Spanish regional carrier Air Nostrum is installing inflight entertainment from Immfly to its entire fleet of over 40 aircraft. 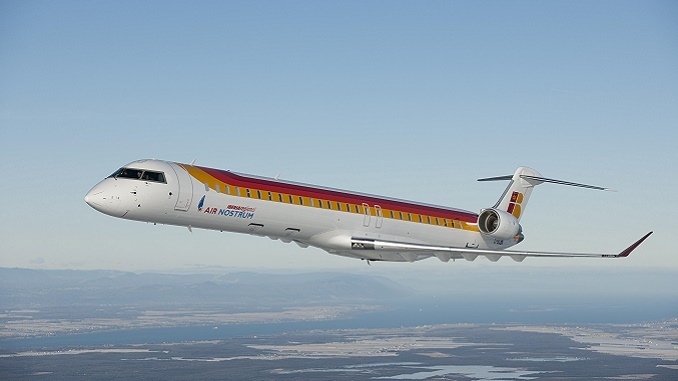 The first CRJ aircraft equipped with the new system will take off this April. The new system is from Immfly and is a solution that allows short-haul and low-cost airlines to have economical and functional embedded onboard digital services. With the new portable solution, Air Nostrum will introduce “Air Nostrum Play”, an onboard digital services platform that will be available as a freemium model to its passengers. Through a set of access points installed inside the planes, passengers will be able to connect to “Air Nostrum Play” and enjoy multiple entertainment modules among other airline services. Passengers will use their own devices to access the entertainment modules such as TV-shows, press, magazines and games. “We are very proud to announce this partnership with Immfly, which will allow our passengers to enjoy media contents during their flights, therefore enhancing their onboard experience. “Air Nostrum is a highly important client for us, it will prove a new technology and with a new business model perfectly suited for regional carries. The airline performs predominantly short-flights and therefore the services will be more oriented to TV shows, series, press & news, due to the flight duration. Air Nostrum is a regional airline based in Valencia, Spain. It is an independent carrier which operates as a franchisee of Iberia Airlines as Iberia Regional. Its main base is Valencia Airport, with hubs at Barcelona Airport and Madrid-Barajas Airport. Routes: Over 200 daily flights to and from over 40 airports located in 7 European and North African countries.